Energy costs are a large expenditure for a business. This is especially apparent during harsh winters when heating bills ramp up significantly. What many business owners don’t realize is that energy costs can be reduced with a couple of quick, cost-effective tricks to give you more working capital for other areas of business. Here are some ideas to help you minimize that energy bill while keeping the room nice and toasty. If there are open vents or rooms leading to rooms that are unused, they should be closed to prevent heat from flowing in unnecessarily. Heating vents should be sealed. Thankfully, you do not need to hire a handyman business to do this. You can save the money and do it yourself. Secondly, employees should be reminded to close the door behind them at all times. Making this small change, you could dramatically lower company energy uses even in the smallest office spaces. One simple way to help keep your office warm while keeping heating bill costs down is to cover your windows whenever it is dark outside. You can do this with simple drapes. Keeping windows covered when it is dark outside helps to reduce heat loss and keep the cold air outside of your building where it belongs. This is an especially important tip for offices with old windows, which are more susceptible to air leaks. Then, open up the drapes on sunny days to let the light in. That helps add warmth to your office building. This is a simple thing you can do to help lower heating bill costs for good without freezing your toes off. The gaps between windows and doors are responsible for a large percentage of the heat being lost from office spaces. Even in small office buildings, these leaks can cause a significant draft that lowers the room temperature quickly. Windows are often left with old, worn-out weatherstripping that fails to stop cold air from seeping through. Replacing the weatherstripping is a quick and easy process. Gaps beneath doors can be plugged with rubber or foam, and the door itself can be adjusted by closing the screws on the metal threshold. Of course, sealing these gaps will keep heat in while maintaining the overall room temperature for employees. This helps you save money on heating costs, which is a must in the volatile Donald Trump economy. This may seem simple, but many people these days forget to simply dress for the weather. Instead of heating your office to the point where employees are comfortable wearing shorts and a tank top inside, tell your employees to layer up. Lowering your heat saves money, and dressing for the cold makes you more comfortable without having to pay for the additional warmth. Invest in a couple work-appropriate sweaters and some fuzzy socks for under your dress shoes, if you must. Instructing your employees, via e-newsletter or even a meeting, to start dressing for the thermostat change will certainly help enable you to lower your heating bill. 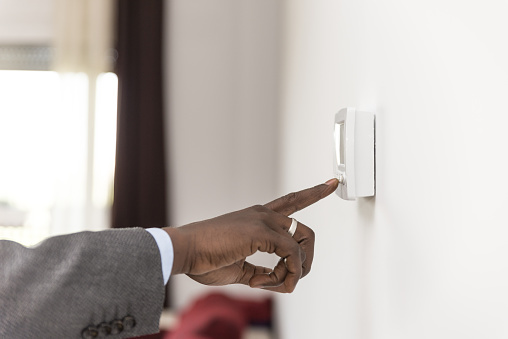 Plenty of difference can be made in preventing heat loss, but knowing when to have the thermostat on and off is arguably more important and does not require you to have any tech background. The thermostat should be programmed so that it is only on while employees are present. Typically, it should be set to turn on about 15 minutes before people are expected and turn off 30 minutes before they leave. Also, make sure that it is set to stay off on non-work days. Programming the office thermostat is a great way to avoid paying for heating if someone leaves the office forgetfully. Along with setting the right times for a thermostat, one should also keep it at an optimal temperature enterprise wide. For offices where work is mostly sedentary, temperatures should be kept at around 68 to 70 degrees Fahrenheit. Every degree raised uses about 8 percent more energy, so it’s important to make note of what the thermostat is set to throughout the day. Keeping the temperature at a comfortable level not only saves on costs but also improves employee productivity too. Business owners should not be wasting precious capital on energy costs. Knowing there are plenty of ways to keep expenditures to a minimum, owners can profit from lower office overhead costs. Additionally, that capital can be put to better use like hiring talent, investing in projects or offering employee bonuses. To save on the office heating bill, these methods require very little effort and are ultimately more cost-efficient than simply turning the thermostat down.